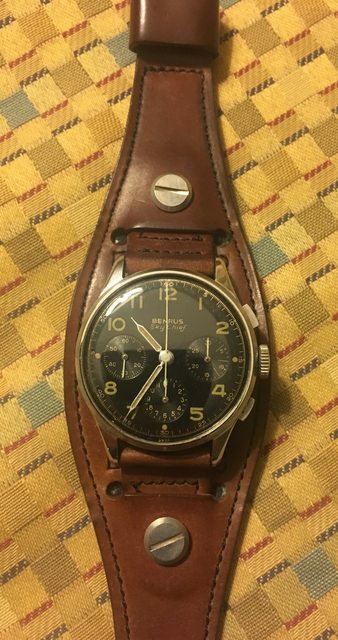 Selling this classic vintage pilot's chronograph. 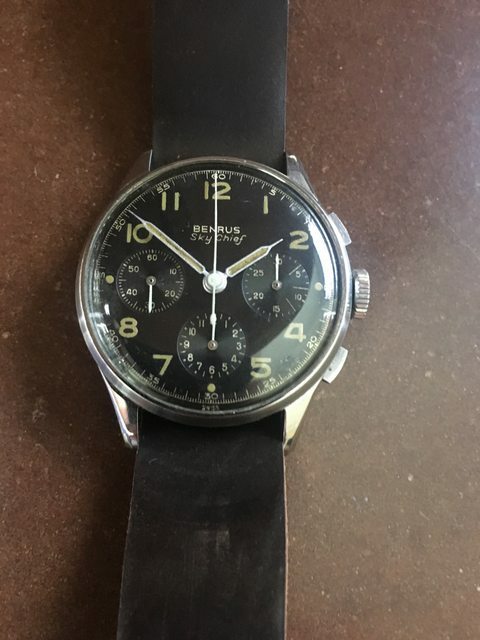 These vintage Sky Chiefs were produced beginning in the 1940s and 1950s by the same Benrus watch company that gave us the venerated Type I and Type II mil-watches issued to U.S special operator/elite warrior types. These Sky Chiefs were aimed at an aviation-keen public and really captured that mid-century flying and adventure-going ethos going on in the U.S. then. They were prevalent and well-regarded enough that world class airlines of the day like TWA, KLM and Northwest reportedly issued them as official equipment to some of their pilots. One collector a few years ago posted on another forum photographs of this model Sky Chief he'd acquired. 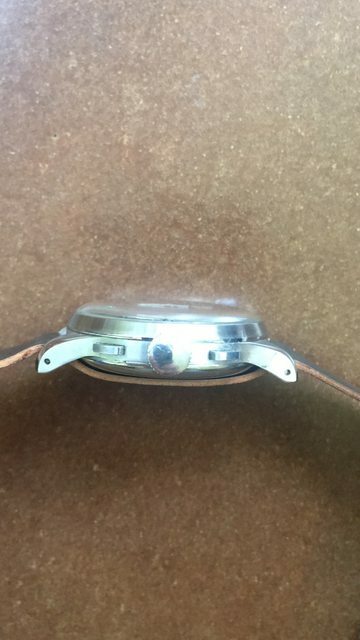 The caseback was engraved, "property of KLM Airlines". They were marketed by Benrus as "Official Watch of Famous Airlines". 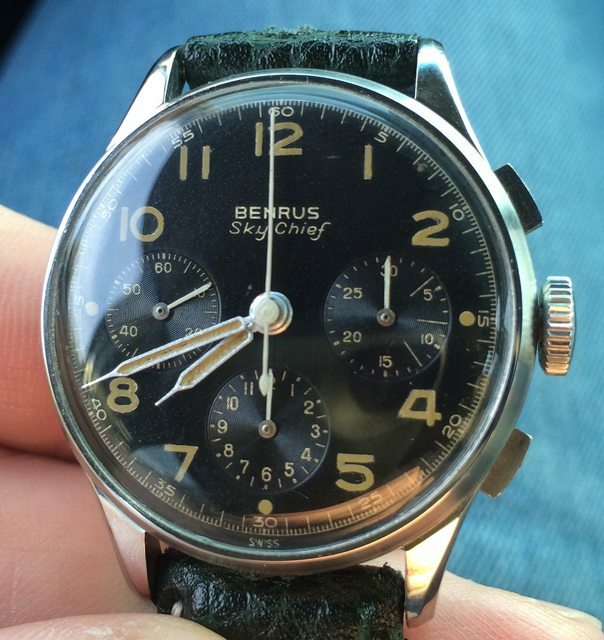 This 1950s Sky Chief is the 35mm black version (Benrus made several versions including a 38mm satin dial variant...a quick Google search will avail you to several excellent articles on the Sky Chiefs). I sold a 38mm model last year here on ChronoTrader, and though I was very fond of that one too, this black dial one is my favorite. They were also earlier than the 38mm model, having been the first introduced I believe in the late 40s. At 35mm it's small for a modern day sports watch, but IMHO works wonderfully as a dressier type piece. Or on a larger Bund-type strap, which instantly converts it into a terrific casual size. 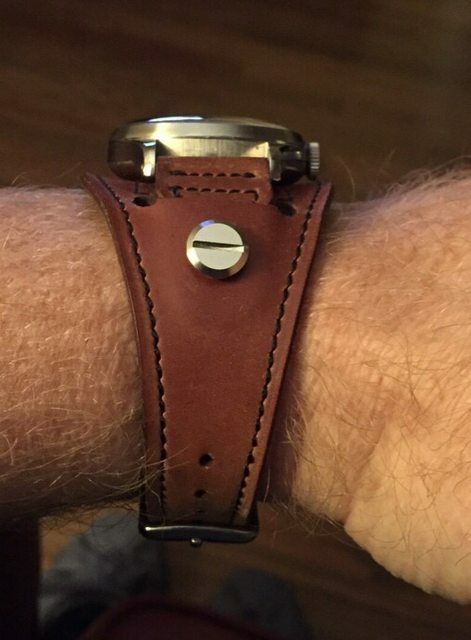 I had Attila Aszodi make me such a strap, which is photographed below but not included in the sale. The pictures tell the story, it's in great vintage condition. Price is $2700 plus shipping. Paypal fees would add 3% to that. It will be sold head only, no strap included. Movement: This one has the famous and preferred column-wheel Valjoux 72. Originally Benrus put the Venus 178 in them, but switched over to the V.72 after a few years. It was serviced in late 2015 by Jesse Hueg in New York, who is tremendous with these. Service included full clean, lube and adjust. It is keeping good time with strong power reserve. Winds and sets correctly. Chronograph functions correctly. Dial and Hands: Many of these Sky Chiefs from the 40's have been re-dialed. This one still has its original gloss black dial and it is gorgeous. When I received the watch several years ago, the hands, also original, were skeletonized, the lume having been removed. These used radium, earlier than tritium. 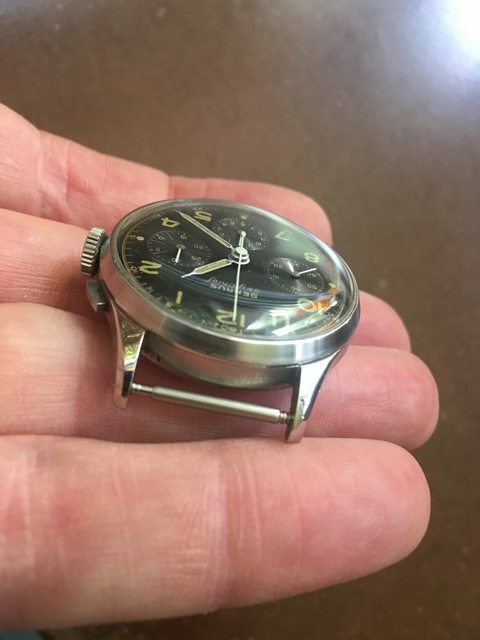 The radium arabic hour markers had faded almost to the point of being illegible, they were quite hard to see in most lighting, like a dark and faded green color against the jet black dial. 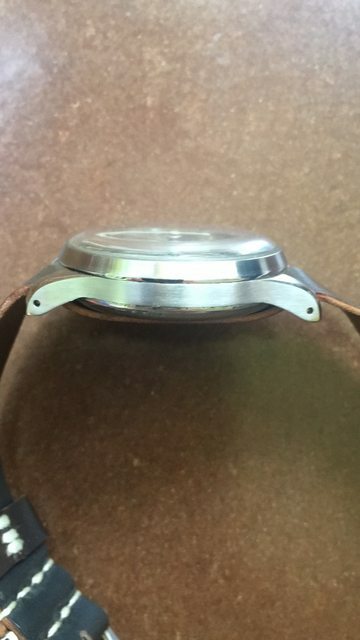 This was another reason I sent the watch to Mr. Hueg for service, he is known for his ability to touch up dials. At my request he used a vintage looking, non-luminous paint and as you can see, looks fantastic. 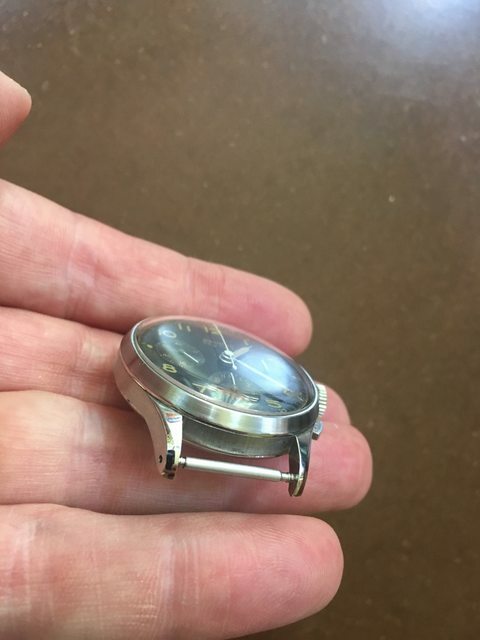 I'm a stickler for originality, but in this case the watch just wasn't legible prior to this. I was very happy with the results from the moment I saw it, big improvement. 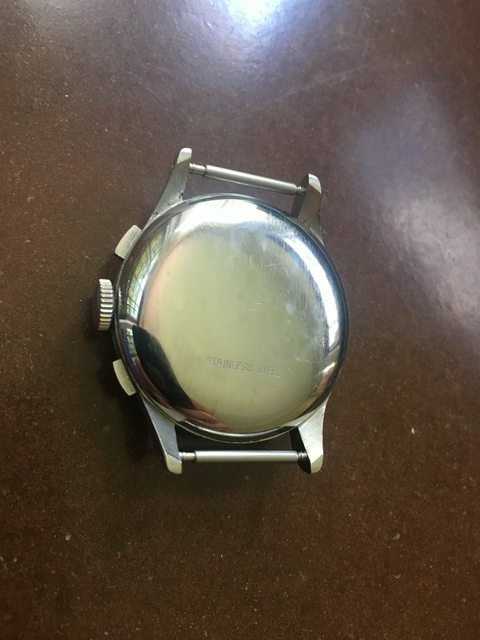 Apart from this touch up, the dial is completely original and in great condition. Still a dark gloss black almost 70 years later! Crystal: Jesse installed a correct, acrylic crystal that looks great. Crown & Pushers: Also original. This a manual wind movement and the crown winds smoothly and correctly, and sets the hands correctly. The pushers depress and release crisply and don't stick. Case: Clean, as you can see. Original case lines still visible. Has been lightly polished.